I use NoVirusThanks Win Update Stop to manually enable and disable Windows Update, but for some reason I can't enable Windows Update through the app, and the service itself. I had Windows Update disable before, and now I can't enable it. I did reinstall the app, but it is no luck at all. sfc/scannow and Windows Update troubleshooting seem to be stuck. Usually those apps mess up with reg/file permissions to prevent Windows Update from re-enabling itself, so it is not gonna be that easy. You should use the same version you disabled WU with to enable it back again, maybe they have changed something in the new version. I have to restore my PC. I am not happy at all that NVT Win Update Stop rekt my Windows Update service for no reason. I can't manually enable the service through Service because everything is grey out. I can't register Windows Update services and files. SFC/scannow and Windows Update Troubleshooting can't fix the problem. I am not happy at all that NVT Win Update Stop rekt my Windows Update service for no reason. To be fair, it did exactly as it was supposed to do, maybe too well, but still, it definitely works. People usually do not enable updates back on, so they have hardly any reports about the issue. Is there a rest button in NVT? I would uninstall it. There is no reset button in it. No matter how many reboot and click on the " enable " button, Windows Update will not work. I think I should go with @TairikuOkami code to disable auto update but manual update work. I forgot the code he provided to me a long time ago. Do you have the code you provided to me a long time ago to disable auto update but manual update work? Manual update work? How can I enable automatic update in the future if I want? Try DavidXanatos/wumgr - it is way faster and it does not start automatically downloading updates upon checking. I prefer manual/manual update, way more reliable, it does not rely on a possibly corrupted %WINDIR%\SoftwareDistribution 's folder. I just using your codes to disable auto check for update. Is this look good? It doesn't look the same as the picture you posted here? ( https://i.postimg.cc/FzvJHSp4/capture_09232018_115646.jpg ). All input codes ran successfully. Try the Windows Update troubleshooter. If that doesn't work, then clean install Windows. Sitting there for hours and days trying to fix it, in that amount of time you can clean install WIndows and have a fresh system. You posted at 6:45 pm yesterday. You could have fixed the issue entirely yesterday with a clean Windows install. Can you see if this works? No work at all. I don't recommend this software at all. Use NSudo in Trusted Installer mode to change disabled Win update and BITS services in services.msc. Also you need Win update service to do offline updates.Always use WUMT wrapper script's wub.exe for one click Win update disabling/enabling the services. I just using your codes to disable auto check for update. Is this look good? 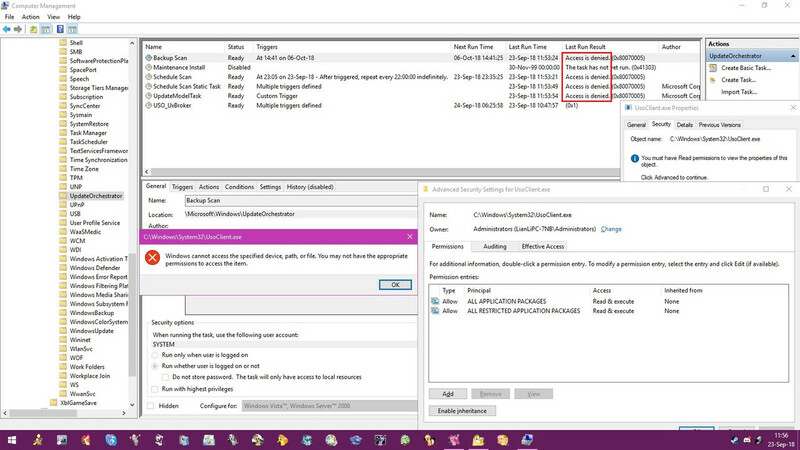 takeown /s %computername% /u %username% /f "%WINDIR%\System32\UsoClient.exe"
icacls "%WINDIR%\System32\UsoClient.exe" /remove %username% "Administrators" "Authenticated Users" "Users" "System"
Personally I would just clean install gaining a pristine brand new lightened system. No way I would spend more than 1h trying to fix it. Personally I would just clean install gaining a pristine lightened system. But I want to disable Windows automatic update and Microsoft makes this a painass process just to turn the switch off. Manually disable Windows Update and Windows Modules services don't work because these two automatic enable later on. No way hell no I am going to touch NVT Win Update Stop app again because this app nuke my laptop Windows Update no mercy. I managed to accidentally disable it by blocking a process, I don't recall which (maybe bitsadmin.exe), will try to remember.